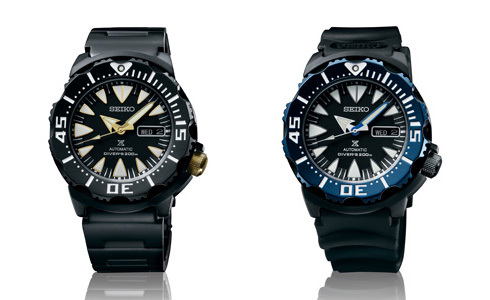 As Seiko brings its Prospex line global in 2014, it has introduced new Prospex “Monster” Air Diver watches featuring black PVD coated cases and 4R36 automatic movements. For the first time Seiko will distribute its Prospex line outside of Japan starting in 2014, and one of the new models for this global push is the Prospex Air Diver 200 m “Monster”. The Prospex Monster has the same specs as the other Monster watches powered by the 4R36 movement, but it features new case colours as well as the redesigned Prospex logo on the dial. Case diameter is 42.3 mm with a 200 m depth rating and a Hardlex crystal (strengthened mineral glass). The 4R36 movement has a 41 hour power reserve, hack seconds and hand-winding capability. Two models are available, both with black PVD coated cases, each taking elements from the 100th Anniverary Blue Monster of 2013. The SRP581K1 has a black case and blue coated bezel, along with a blue minute hand, and is on a black rubber strap. And the SRP583K1 has a black case and bezel, along with a gold hands and a gold crown, on a black coated bracelet. The new Prospex Monster on rubber strap will be US$475, while the version on bracelet will be US$595.